Is The Umbrellas Of Cherbourg’s score at odds with its narrative? Music in movies generally has a pretty clear function. There are exceptions when it comes to pop tunes, which are sometimes employed oppositionally—Quentin Tarantino does this a lot, for example, in Reservoir Dogs, whenMr. Blonde tortures a cop while dancing around to “Stuck In The Middle With You.” But when the director hires a composer to create original music, it’s rare to find yourself uncertain why you’re hearing what you’re hearing. Mediocre scores, which abound, irritate because they attempt to dictate what the viewer should feel at any given moment. “Hey, you’re excited!” “Wow, isn’t this sad?” But even terrific scores are fundamentally illustrative—they’re just more subtle about it, or they’re so stirring or catchy that being blatant doesn’t matter. The idea that a piece of music could be genuinely mysterious—which is distinct from “creating a sense of mystery”—seems downright radical. It would be particularly radical in the context of a musical, and more radical still were the tune in question one of the most celebrated in the history of cinema. Which brings us to Jacques Demy’s masterpiece The Umbrellas Of Cherbourg, and its remarkable final scene. (Note: Analyzing it requires revealing the plot of the entire movie. So, you know, spoilers.) Unlike most musicals, this one doesn’t juxtapose big production numbers with conventional dialogue scenes—the film is sung from start to finish, which makes composer Michel Legrand its de factoco-screenwriter alongside Demy. The story involves a passionate romance between Geneviève (Catherine Deneuve), a young woman who works at an umbrella shop, and Guy (Nino Castelnuovo), an auto mechanic who’s sent to fight in the Algerian War before the two lovers can marry—but after she gets pregnant. Because Guy doesn’t write Geneviève frequently, her mother persuades her to forget about him and marry a rich man who’s been courting her; Guy, too, winds up in the arms of someone else, a woman who’d cared for his sickly aunt. The movie’s devastating epilogue—I initially wrote “quietly devastating,” but as we’ll see, it depends what you’re focusing on—takes place four years after the main action, when they meet again. On its surface, this epilogue is unbelievably depressing. Though Geneviève and Guy haven’t seen each other in years, they both seem entirely unaffected by this chance meeting. As soon as they enter the gas station’s office, Demy isolates Deneuve by having her walk over to the window, her head framed by the Christmas tree and its reflection; the shot makes her look very much alone, though the two of them are actually close enough that Demy can cut to a two-shot when the other employee walks in to ask what kind of gasoline Geneviève wants. (Her indifference to the question symbolizes both of their general attitudes.) Guy smokes furiously as only the French can, looked vaguely pained and offering virtually nothing. When she asks him if he wants to see his daughter, whom he’s never met, he declines in a way that suggests not that it would be too wrenching for him, but that it hardly seems worth the bother. They don’t even really have any parting words. “Are you all right?” “Yes, I’m fine.” After which she simply drives out of his life, with both of them aware that they’ll likely never meet again. Guy’s wife and child show up as Geneviève leaves, and he’s clearly happy to see them, but they’re characters we barely know. So much for words and images. But the entire scene is accompanied by “I Will Wait For You,” the movie’s primary romantic theme, which had previously been performed by Geneviève and Guy as a lover’s duet just before he went off to war. (With English lyrics, the song became a minor standard, covered by such artists as Tony Bennett, Frank Sinatra, and Louis Armstrong.) The lyrics, not heard in this scene but still in the viewer’s memory, are an ironic rebuke, since Geneviève did not, in fact, wait for him. But even more interesting is Legrand’s arrangement. The natural impulse would have been to reflect the circumstances with a more doleful, understated rendition of the melody; Legrand instead has the orchestra perform it as if Romeo and Juliet had miraculously come back to life and were together at last. 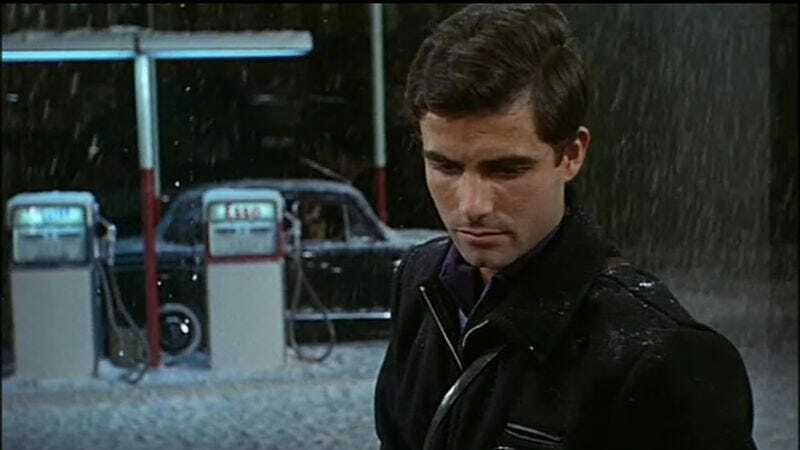 The final refrain, as Geneviève drives away with the daughter Guy has never seen and now never will, is so passionate and sweeping that it threatens to tear your heart out. Rarely has a movie’s text and its musical subtext been so utterly at odds. The Umbrellas Of Cherbourg isn’t generally discussed as a film with an ambiguous ending, but I’ve never been sure what to make of this symphonic overkill. There are two possibilities, both equally affecting. The cynical interpretation perceives the juxtaposition as bitter irony—what we’re hearing is the residue of feelings that seemed untamable at the time, yet no longer exist. Deneueve and Castelnuovo’s robotic performances in the scene suggest as much, and so does Guy’s energetic reaction to his wife and child when they appear (which is the last thing we see as the movie fades out). A diehard romantic, on the other hand, would insist that what we hear is much more truthful than what we see. In this interpretation, the score isn’t mocking them, or even weeping for them—it’s speaking for them, conveying what neither can say aloud, or even admit to themselves. Their bland conversation and polite apathy is a charade, necessary to preserve the wholly new lives each has created without the other. They pretend not to care, but Legrand knows otherwise, and instructs his musicians accordingly. Cue handkerchiefs. Which interpretation do I favor? One of the many reasons I love this movie is that I’m honestly not sure. Both are enormously poignant, albeit in different ways. And Demy’s image-making beautifully reinforces the dichotomy. On one hand, it’s an incredibly romantic scene, set at Christmastime during a lovely soft snowfall. (I wonder how deliberately artificial Demy wanted the snow to appear? The movie as a whole frequently eschews naturalism for bright stylization, especially when it comes to umbrellas.) On the other hand, it’s the final meeting of two formerly ardent lovers… taking place at a gas station. What they always dreamed of, no doubt. Mostly, I just admire Demy and Legrand’s adventurousness—the fact that they settled on an ending that not only can be read two different ways, but that would play in a completely different register accompanied by any other piece of music, or even by the same piece of music performed in a different way. (I can readily imagine arrangements that would clearly lean in one direction or the other.) It’s a movie in which the music doesn’t tell the viewer what to feel, but feeling nothing is impossible.